A committee chaired by Sir Henry Maybury brought in more signs in 1933, including "No entry" and "Keep left"
The girl in the school children crossing sign is based on a picture of herself. She didn't like the grammar school overtones of the earlier sign, which featured a boy wearing a cap and carrying a satchel. Image caption Calvert thought this sign was like an "illustration from Enid Blyton"
"There was a different attitude to schooling coming in and I thought, wouldn't it be nice to turn it around and have a girl leading a small boy." The cow featured in the farm animals warning sign was based on Patience, a cow on her relatives' Warwickshire farm. And Calvert is also responsible for the much-parodied men at work sign. It has long been remarked upon that the man digging actually seems to be struggling with an umbrella, and Calvert wishes she had made the shovel more shovel-like. Kinneir and Calvert's designs changed the British landscape and they became a role model for modern road signage all over the world. 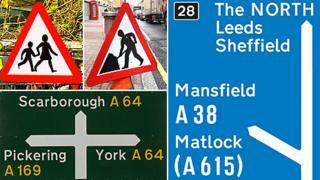 The signs promote an image of Britain, says traffic sign designer Bryn Buck. "Traffic signs are a brand like Armani suits. A sign for the M4 is the first thing visitors see when they leave Heathrow." Design commentator Michael Czerwinski hails them as a success story of the modernist movement. "We do not question them like modernist buildings and they have not been dabbled with as much as other things have. The fact they are still in use today says a lot about the success of the designs." The system has been added to and adjusted but the fundamentals haven't changed, adds Buck. "By keeping it simple, it stands out and doesn't age. It is still informing people more than 50 years after it was created." Transport and Motorway, which is used only for route numbers on motorways, are still the only two typefaces permitted on UK road signs. Transport is also used in several other countries, including Iceland, Ireland and Portugal, and in much of the Middle East. "The last thing you want to do when you're driving along at 77mph is think 'look at that lovely L or T'. All you want to do is be told where you are and where you turn. "The key is not noticing it. When you are designing a typeface for signage, you know you have done well when no-one comments on it." Jock Kinneir, who died in 1994, was resigned to this fact. In 1965, he acknowledged that his and Calvert's designs fulfilled their function so efficiently that the public would take them for granted. "Direction signs and street names are as vital as a drop of oil in an engine, without which the moving parts would seize up."